For size reasons, publication comes in two separate PDF files. 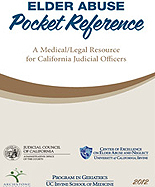 In April 2008, the California Administrative Office of the Courts (Renamed Judicial Council of California 08/2014) was awarded a grant by the State Justice Institute (SJI) to develop, pilot test and disseminate dependency drug court performance measures. Developed collaboratively with an advisory team consisting of representatives from the courts, California Drug Court Coordinators’ Work Group, Department of Alcohol and Drug Programs, Department of Social Services, and the National Center for State Courts. Currently, the Judicial Council of California provides technical assistance to courts who wish to adopt these measures, or who wish to consult on implementing local performance measures in their dependency drug courts. A recent study examines the potential to apply specialized "problem-solving court" principles and practices more broadly throughout state court systems. Based on focus groups and interviews with 35 judges in California and New York, the study assesses which problem-solving court practices are transferable to general court calendars, the major barriers to transferability and how problem-solving methods may be more widely disseminated among judges and judicial leaders. Where to go if you need help. To find a California Drug Court email collaborativejustice@jud.ca.gov Be sure to indicate which city you are looking in.